15 Ohio Festivals You Can't Miss in 2019 - Ohio. Find It Here. Get an inside look at Ohio's best festivals in 2019! The new year in Ohio provides plenty of festivals that celebrate just about anything you can imagine: food and drink, local harvest, the unusual, arts, culture and tradition and even twins. Take a look at the variety of festivals that will take place in Ohio in 2019. Plenty of Ohio communities celebrate Oktoberfest in September and October. These festivals combine food, drink and tradition usually over a several day period. Oktoberfest Zinzinnati is the largest in the country and takes place in Cincinnati in September. Considering the German influence in Ohio, it’s no surprise that there are multiple celebrations of this event, which started as a wedding celebration in Bavaria and eventually added the key component of beer. Other food festivals include the Marion Popcorn Festival; Jungle Jim’s Cheese Fest, an indoor event in Fairfield and the Walleye Festival. Many of the festivals that focus on the local harvest take place in the second half of the year, but remember that some things like maple tree tapping happen in the spring. The Geauga County Maple Festival, the oldest maple festival in the country, celebrates that event with a variety of fun happenings at its festival. A bathtub race, lumberjack competition, a sap run, and, of course, maple stirring are all part of this festival. Ohio’s agricultural heritage means that there are plenty of festivals related to crops. Several towns celebrate corn, Grand Rapids has a fall apple butter festival, and Circleville proudly shares its pumpkin bounty. Check out their countdown calendar. Speaking of Ohio’s agricultural heritage, the Steam Threshers Festival in Plain City showcases implements and vehicles from the past. Looking to spend a few days listening to music, exploring the visual arts, or even immersing yourself into the distant past where jousting and sword fights are common occurrences? There is definitely a festival for you. The Ohio Renaissance Festival takes place in an authentically recreated village resembling 16th Century England. Watch jousting matches, see knights in shining armor, and enjoy juggling, traditional arts and crafts, musicians and dancers. The Crosby Festival of the Arts in Toledo and Delaware Arts Fest feature art in a variety of media including glass, ceramic, sculpture and painting. The Nelsonville Music Festival features a variety of styles of music. The Cleveland Orchestra’s summer Blossom Music Festival takes place in the scenic Cuyahoga Valley. Classical music dominates, but pop music also figures in. Theatrical productions, ballet, Broadway and art displays are also components of this venue. 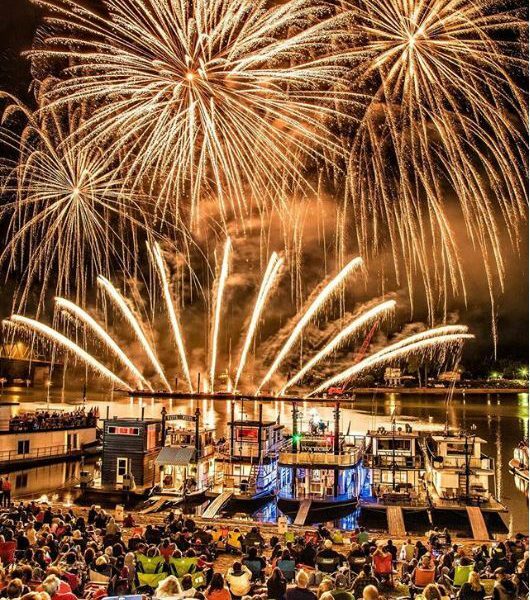 Marietta’s river setting makes it the ideal spot for its annual Ohio River Sternwheeler Festival. The river teems with these vessels, with several featured vessels highlighted during the festival. One of those is the Valley Gem, the largest sternwheeler between Pittsburgh and Cincinnati. Other fun festivals include the Balloon Fest in Coshocton and the Duck Tape Fest in Avon, where there is a contest for the best items made with Duck Tape. If you are one of the population who has a twin, you will find a festival dedicated to twins and multiple birth siblings at the Twins Festival in Twinsburg, of course. The eclectic choice of festivals makes it easy to find one to satisfy any tastes or interests. Don’t assume that festivals happen only during warm weather as there is some type of festival going on somewhere in Ohio every month of the year. If you have a special interest in a certain festival, consider becoming a volunteer. Mark your calendar now and plan to enjoy at least one of Ohio’s many festivals in 2019.